Mike and I have wanted to see Django Unchained for a long time, but we never got around to it while it was in the theater. As huge Quentin Tarantino fans, we knew this was going to be a pretty good flick. 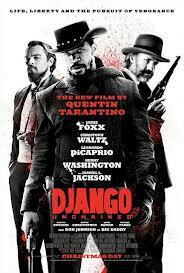 Plot Summary: (from IMdB) In 1858, a bounty hunter named Schultz seeks out a slave named Django and buys him because he needs him to find some men he is looking for. After finding them, Django wants to find his wife, Broomhilda who along with him were sold separately by his former owner for trying to escape. Schultz offers to help him if he chooses to stay with him and be his partner. Eventually they learn that she was sold to a plantation in Mississippi. Knowing they can’t just go in and say they want her, they come up with a plan so that the owner will welcome them into his home and they can find a way. Seriously, you can’t go wrong with Quentin Tarantino and you can’t go wrong with the rest of the cast! I absolutely love Christoph Waltz – I’m not entirely certain how they called him the “supporting actor” in this film, but am definitely glad he won an Oscar for it! There was a lot of controversy surrounding this movie when it was released – particularly for the use of “the n word”. Yes, it was there, but I don’t think that it took away from the film. It was also criticized for being too violent, something that I think people should just expect from a Tarantino film – let’s not pretend that Pulp Fiction, Reservoir Dogs, or Kill Bill Volume 1 lacked in the violence department. This was a pretty good movie! For those of you who don’t know, I’m involved with the Sacramento Metro Fire Community Emergency Response Team. It’s an amazing program that trains folks in disaster preparedness, but also does a ton of non-disaster related community service. It’s this program that inspired me to become an EMT and that I do a large amount of community service through. Yesterday I volunteered at the 2013 Petapalooza. It was a really neat event – they had local K9 demonstrations (absolutely amazing dogs! ), Splash Dogs competitions, animal adoptions, a petting zoo, live music, and tons of vendors. People could bring their pets out to the park – which originally sounded like a recipe for disaster to me. I was actually really surprised – we treated four people throughout the day for dog bites (some of them from their own pets), while there were hundreds of dogs there. All in all, it was a really fun event – it was neat to see all of the different types of dogs, large and small. There were dogs I had never even seen before! The K9 demonstration was probably my favorite thing to see – they had several of the different law enforcement agencies there with different breeds of police dogs. They showed how they could clean five foot walls easily (the announcer said that some of the dogs could jump up to twelve feet!) and climb chain link fences (allegedy very difficult since the dog can see through it and would rather attempt to run through than go over). By far the coolest part of the demonstration was the bite suit – they had a couple guys bundled up and showed how quick these dogs can be, as well as how they hang on once they sink their teeth in! They can even “redirect” – basically if the officer has multiple bad guys, the dog will bite, then if given the command will release and go bite someone else. It was a great day with a great team! … still get it fixed. Nice photobomb, Shadow. 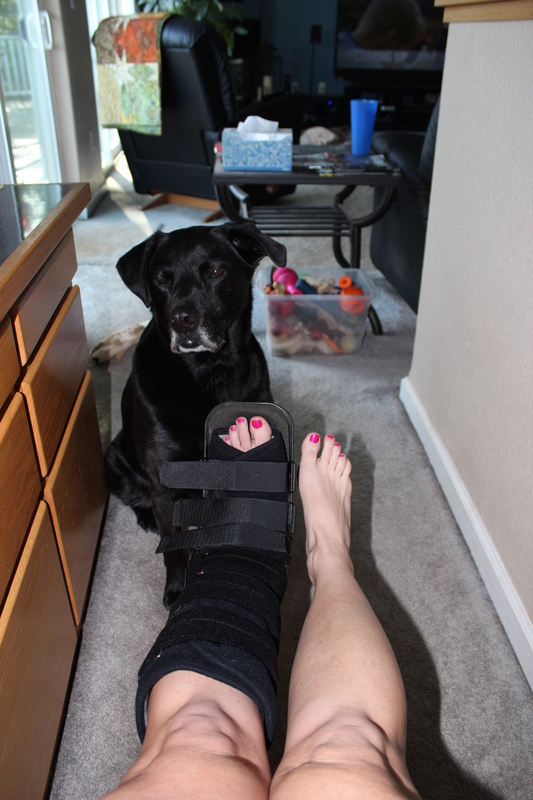 Anyways, the verdict came back – no break or stress fracture, but rather a torn ligament. One that’s not bad enough for surgery, but that I need to take care of. So it’s two weeks of the boot, ice, and elevation. The last few days of the week were rough… the boot is hot, itchy, and I hate not being able to do the things I want to do. Poor Mike has put up with cranky Anna for the last couple of days. The doctor said I could swim, as long as it didn’t cause me any pain… I may or may not test that today. In case you forgot, in about three weeks I’m slated to swim from Alcatraz back to shore at Sharkfest. Fingers crossed that this doesn’t impact my swimming too much… I may take it easy the next few days and just do pull workouts. Think healing thoughts! I love a good cobb salad – add it to a tortilla and you can’t go wrong! Hard boil the eggs, then dice them. Cook bacon in a medium nonstick skillet over medium heat until crisp. Remove bacon from pan, saving the drippings. Drain bacon on paper towels, crumble and set aside. Add garlic to the bacon drippings and cook for 1 minute, stirring frequently. Remove from heat; add vinegar, oil, and mustard, stirring until combined. Add chicken to pan; toss to coat. Combine ranch and Sriracha to taste. The original recipe says to toast the tortillas over the burner… we prefer to give them a 10 second per side fry (using the same oil we made the chips in). That definitely keeps it a little healthier (I guess our “twist” isn’t so light…). 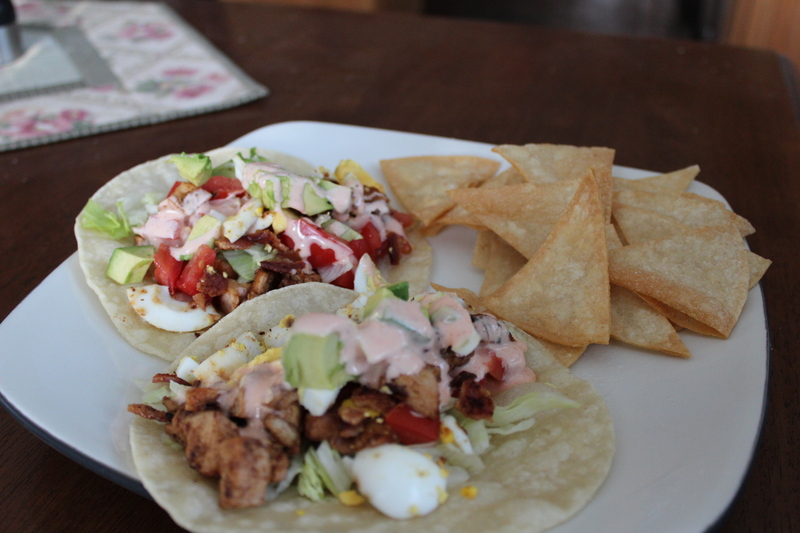 Now build your cobb salad taco! 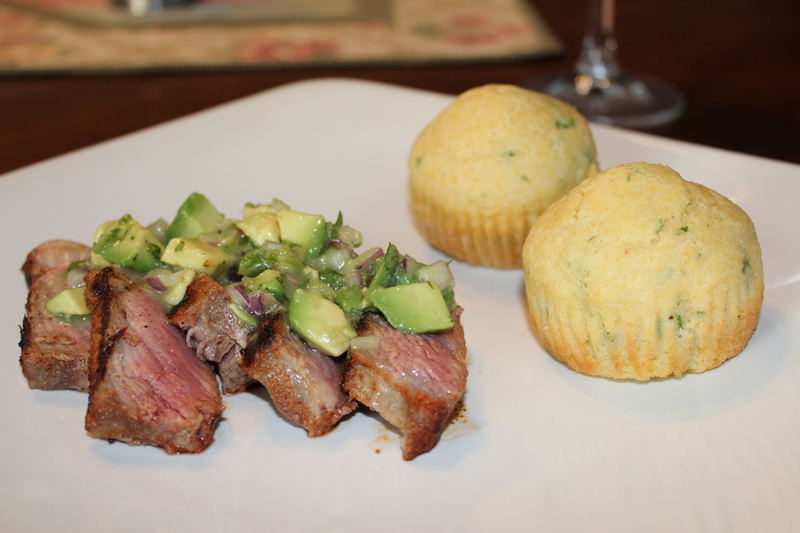 This was a super easy recipe and you can easily add other stuff (in fact, it called for bleu cheese, but I hate the stuff, so I left it out). Enjoy! This week’s favorite song is “When I Was Your Man” by Bruno Mars. In case you haven’t noticed, this guy is EVERYWHERE right now. It seems like one of his songs is on nearly every radio channel I turn to. This particular song has beautiful lyrics – a reflection of the “what I should have done” thoughts. Since that fateful 1998 video, SNC has come out with several albums, mostly that cover pop songs with their 10 person a capella group. They are absolutely talented and amazing… I can’t wait to see them live!